"If you become my wife, I'll grant any wish..." Maybe it wouldn't sound half as crazy if Saeju wasn't told this by a cat (who may or may not be some kind of prince). But she's desperate for some payback, particularly when her longtime crush blows her off, ice-cold style. But what happens when you invite someone downright... unearthly... into your life? Saeju's about to find out—particularly when one strange cat becomes one strange "brother" she didn't ask for! Story(8) - Before you start on the manhuwa, remember that the protagonist you will follow will be female and not male :P The story is set in a fantasy background clashing with reality a bit. At first it felt like an Alien invasion(you'll know when you read it), but how the plot turned from here and there was superb. Art(8)- Mangaka has succeeded to give the best when coming to drawing, the character's eyes particularly have that "piercing" feeling. Character(8) - Character development was very good, there were different type of personalities to explore and even though it feels like the protagonist should be the main lead, eventually a supporting character takes the whole stage. Enjoyment(7) - I enjoyed the manhuwa, in the sense it was sometimes frustrating, anticipating and captivating. The romance events were particularly good and prescribed conflict. Overall - I give it a 7 but the initial score was 8, the story was prolonged to give a conclusion and readers can fairly guess that, so i took a point out. I normally don't go near fantasy manga but in the case of this manga, I am glad that I decided to give it a shot. The story line is interesting and somewhat unique; I say "somewhat" considering how the alien theme has been used throughout a number of manga/anime series. Before I start, forgive my probable grammar and spelling mistakes (it´s been a while since I don´t write in English). Opinions accepted! So: Simple love story that makes you want more. For me, it was a bit difficult to follow at first: didn´t quite understand the dialogues. i think many things are lost in translation and also, we´re talking about manwha (which might be a bit tricky for those who -like me- are used to japanese manga). However, it has beatiful drawings, not only the main characters, also the scenery and clothing. The female character is great! 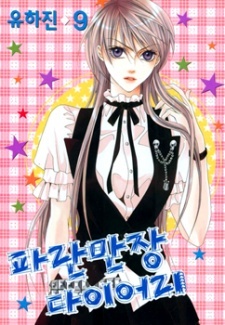 : strong and crazy teenager -not the usual dummy style- and there are some secondary love stories around the main one. It´s supposed to be completed, but it´s not easy to find all of the chapters, so i didn´t actually finish reading it, but i wanted to recommend what i´ve read so far, enjoy!